We design thoughtful, inviting outdoor spaces. Creating an outdoor space for you should be easy. We follow this process to ensure our projects start and end with organization, efficiency and saftey in mind. Following consulation, thoughts and ideas are specifically introduced on CAD drawings and options are introduced on paper. Rendering and all details are presented in a final plan. Pricing for your project is easily explained with listed options for the scope of your project. Final contracts are processed and projects are queued into schedule. Qualified, experienced staff prepare a game plan and your project commences. When work is complete, a walkthrough takes place so that you are comfortable with the ongoing care of your yard and its components. We highly recommend Michael, Jeff and the Nokomis team for their excellence in landscape design, knowledge, creativity and professional workmanship. This crew demonstrates an exceptional work ethic, courteous friendly service and attention to detail. Our landscape project more than met our expectations and we couldn’t be happier. Thanks Nokomis! Organizing your project and illustrating ideas in CAD form is a great way to get your job started in the right direction. A detailed Landscape Plan will allow your to obtain precise quotations from, divide a large project in to a few small ones, and provide a transparent representation of the scope of the project you will contract out. Our certified installers can provide you with an efficient system to properly irrigate your lawn, or provide a water-conscious drip system to your new plants and gardens. Our company stays current with certifications through IIABC, providing you with up-to-date practices and current technology. In an area, where our climate requires water conservation it is vital to have a well designed system that is properly installed. 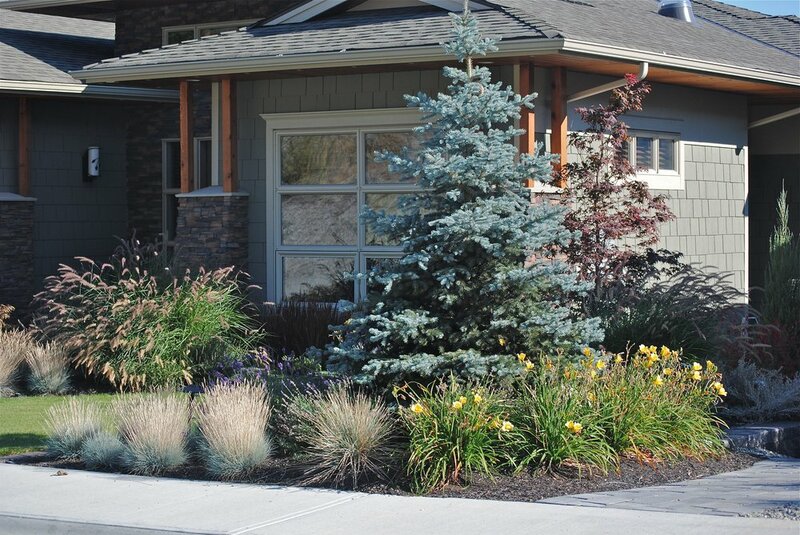 Providing the right plant suited for the right location, combined with an overall balanced planting plan will help achieve a look well suited for a magazine cover feel. Seasonal interest, color themes, balance, texture and form all come to mind when providing the right design for your outdoor space. Whether retaining walls are required to stabilize slopes, level area of your project out, or provide accents to seating & entertaining areas, we can offer several options to fit in well with the environment around you. Available to you are numerous brands of modular block retaining walls, natural rock walls, and other options like gabion or earth walls. Slab steps are a nice option to incorporate into design. Adding a area for seating and entertaining using complimentary surfaces such as decorative pavingstones, concrete slabs, or natural flagstone will allow for spaces for you and your guests to nestle into a cozy part of your yard. A patio can be an extension of your house or an external private spot within your garden. The same creativeness can go into driveways, pool decks and connecting pathways. Depending on your location and lifestyle, adding an evening element to your favourite space will help you appreciate your landscaping for a few extra hours a day. Showcasing focal points of your garden, providing entertainment lighting or simply making a driveway or pathway more accessible after dark, are some of the features we can suggest. We use quality LED lighting with long lasting powder coats and decorative metals. Providing a small or large waterscape to your garden will give you a desirable focal point and a soothing element your property deserves. From natural river beds and ponds, to formal fountains and contemporary bubblers, let our creative team enhance your outdoor living space. If a pool is at the top of your backyard list, let our design team help ensure you work the right size and shape pool into your project. We work hand-in-hand with a local pool installer to add a swimmable option to your property. We will ensure that all details of your project are met and that you are in the right hands when your private oasis takes shape.